Very beautiful and spacious Bourgeois style apartment with high ceiling and windows to bring in lots of natural light. Located on the edge of the old town (Le Suquet) in the center of Cannes with only 5 min to Palais des Festivals and less then 10 min to the beach, this is an ideal apartment both for holiday and congress. Walking distance to everything. You have two bedrooms with a double bed in each. To one of the bedrooms you have en-suite bathroom with bathtub. There is also a second bathroom with shower. If you need additional bed space, the sofa in the living room can be converted into a double bed. Dinner table for six+ persons. The apartment is best suited for a family with one or two children, or for two couple on holiday together. Individual air conditioning in all rooms. A small balcony offers views of the Marché Forville, one of three food markets in Cannes, and further out to the Vieux Port (old port) and the Mediterranean. The house and the apartment was built at that time one had servants so there is also a second balcony, which was originally the kitchen entrance. Here you can sit and enjoy the afternoon and evening sun before it’s time to head out in Cannes nightlife. This is the place to stay if you prefer the old town and appreciate the charm of traditional apartments with modern comfort. 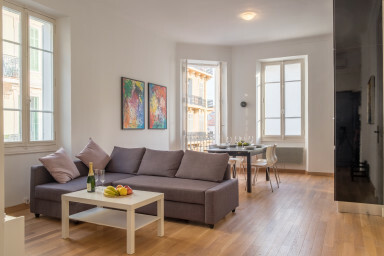 The apartment is located in the historic Le Suquet – Cannes’ Montmartre, in the middle of everything, restaurants, the beach, shopping and everything else that Cannes offers. Within 200 meters you will find the taxi station and the station for airport buses. The short distance to the festival palace makes the apartment an ideal accommodation for festival and congress visits. If you arrive by car you have the Forville Parking Garage just next to the house. – Shops for essentials and grocery: Just around the corner. – Restaurants: Just around the corner. We stayed at the apartment during the Mapic week in November 2018. The apartment was stunning, modern, clean and well-equipped. Location is excellent just a stone's throw from the Mairie. The hosts were helping and welcoming and always available for answering questions. Strong recommendations. Lägenheten vi hyrde under en vecka i augusti var trevlig med ett fantastiskt bra läge. Det var mysigt att sitta på balkongen och äta frukost eller ta igen sig på kvällen. Praktiskt att ha kvartersbutiken Monop, marknaden Marché Forville och det lokala bageriet i närheten. Vägen till den allmänna badstranden Plage du Midi kantades av restauranger, vinbarer och hamnen med lyxiga båtar. Cannes kunde erbjuda alla familjemedlemmar vad vi ville av bad, shopping och uteliv och det blev flera kvällspromenader då vi bara njöt av livet. Lätt att ta tåget till olika platser längs den franska Rivieran. Vi är mycket nöjda och kommer gärna tillbaka.